Disclaimer: This post contains affiliate links and may result in the compensation of the blogger upon viewer's purchase(s). Before I started Small Steps to Happiness, I admittedly never wore denim of any kind. Denim, jeans, jeggings, chambray - you name it, I didn't have it. One of my main fashion goals this year was to invest in more jeans, since it's not exactly appropriate to wear leggings to work everyday (as much as I wish I could). Yet here I am, denim on denim! While I didn't exactly wear this outfit to work, I did try it out for brunch at Pies 'n' Thighs with some of my favorite ladies. Since I'm fairly petite, it's been a difficult process trying to find jeans that are both flattering on such a slim frame but also not way overpriced for something that I'm bound to get paint on. In my search for comfortable, affordable, and fashionable jeans, I finally settled on about seven pairs from H&M (I know, it's impossible to buy just one of anything). They were all either the Super Skinny jeans or the Skinny High Ankle jeans (purchased on sale for under $20 each). H&M's size 2 in these jeans were a perfect fit all around except for the length. It did end up falling almost to my toes, but easy fix with the cuffing trend. Check out the full look and outfit details below! I am proud of myself for being able to step out of my comfort zone and slip into some denim on denim. So fellow fashionistas, what's stopping you from trying something new? Thanks for stopping by and if you liked this post, show me just how much by liking it on Lucky! Omg the way you paired denim on denim here is so cutee! I definitely need to check out H&M jeans. Any tips on how to keep up with sales? Not only H&M but from different stores? :* I try my best. 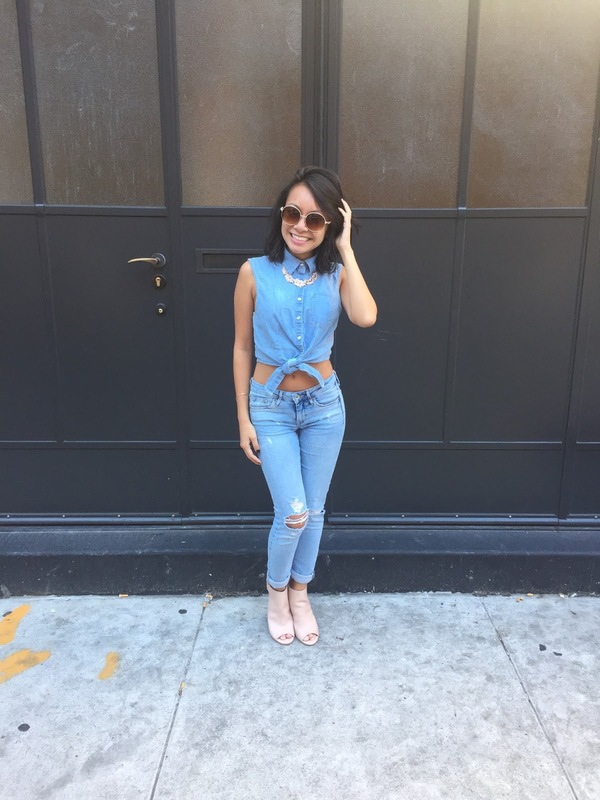 Look at you, all decked out in denim! Super cute! I've followed you with GFC! Hope you'll connect with me, as well! Happy Labor Day Weekend! As we all know, summer is quickly coming to an end and most of us summer-lovers have a hard time transitioning to our fall favorites during the lingering heat. So why not keep the summer lengths and just switch the colors instead? In the look below, I've styled some old boyfriend jeans with a burgundy open back crop top ($10) and all black leather espadrilles ($35). Plus the sunnies are now less than $10 at Loft! This color combo screams fall, but I was still able to keep cool in the 90 degree weather. Check out the details below! In honoring Small Price Tags, I've decided to compile a list of some of my favorite fall essentials as well as some sales going on this Labor Day weekend. The below items are just some of my fall favorites. As you can tell, I'm a major shoe-holic. I love a relaxed and casual look, but those ASOS Cut Out Heeled Booties are just to die for at only $26 (not even taking into account the additional 10% off)! Happy Tuesday Shoesday! 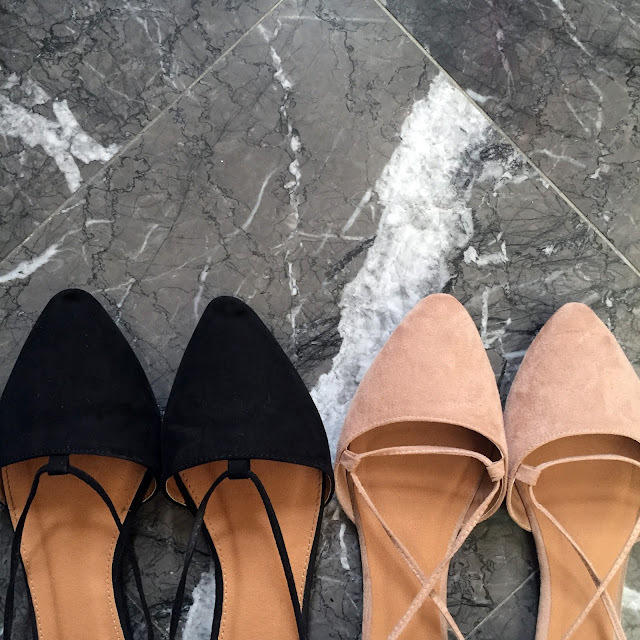 For my first edition I will be sharing my current obsession, lace up flats! In all honesty, I hate flats. I have such a difficult time finding ones that are both supportive on my arches and comfortable enough not to require endless amounts of breaking in. However I could not help but fall for this season's biggest shoe trend. Hello loves! Since I am currently in denial about being back in the real world, I figured now is the best time to share this look. I just came back from Punta Cana, Dominican Republic for a beautiful beach wedding at the Hard Rock Hotel and Casino. The dress code was simply stated as formal beach attire. I took this as a chance to really explore today's current trends in the most simplistic and Linda-like way as possible. While this outfit is more out of my budget than I would typically spend (totaling around ~$150 for everything), it was definitely worth it after all of the compliments I received from people I didn't even know. Definitely a show-stopper! I am the voice behind Small Steps to Happiness, constantly in pursuit of love, shoes, and genuine happiness. For business inquiries, features, events, or general questions, please feel free to send an email to SmallStepstoHappinessBlog (at) gmail.com.